Webster Vienna held its Inaugural Graduate Research Summit (GRS) on Nov. 28. The evening began with a specialized thesis workshop, followed by oral presentations given by four students and alumni and a keynote address on the importance of student research. The research presented was selected by the scientific committee, with awards for the top presentations. The Ghana Campus held its inaugural multicultural Thanksgiving dinner on Saturday, Nov. 25 to celebrate its diverse student population. The Multicultural Thanksgiving dinner brought students and staff across many different nationalities including Ghana, Nigeria, United States, Congo (Brazzaville), Togo, Mali, Cameroon, Guinea, Ivory Coast, etc. Webster University is one of the top universities in Missouri for sending students to study in other countries, and for hosting students from other countries to study in the state, according to the 2017 Open Doors Report. Celebrated each year, Thailand’s Loy Krathong Festival provides an opportunity for people to wave goodbye to their troubles of the past year and welcome a future of good fortune. Celebrations are held across the country, but are most prominent in Sukhothai, Chiang Mai and Bangkok. 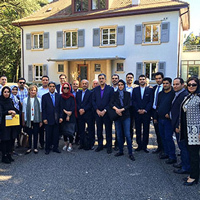 The Geneva campus recently hosted an Iranian delegation of business leaders and entrepreneurs led by the Tehran Chamber of Commerce. The Iran-Switzerland Chamber of Commerce selected Webster as the academic focus for the delegation's visit, and as a follow-up of Webster's “Doing Business in Iran” conference held last May.